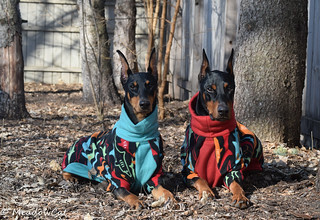 Doberman Forum : Doberman Breed Dog Forums > General Discussion - Non Doberman Related > New member introduction > Not quite “new,” but an introduction! Howdy to all here at DobermanTalk! A little about myself: I’m a veterinary student with a serious interest in the breed spanning the past few years, but sparked when I was very young and a dobe barked at me in the animal shelter. Strange, really, that one interaction with a young frustrated dog in the early 90s is what set it off. But here we are! Being a student, I know I don’t have the time for a dog so I’m making do with a cat and a lot of research for the time being. And study breaks on DT, of course! The serious, realistic search for a puppy will possibly be starting soon, so I’ll probably have tons of questions for the forum in the upcoming months. Welcome! Thanks for speaking up and joining in! Hi SN! and welcome from the Pacific NW. Welcome to DT from Utah. Interesting about your one interaction with a Doberman that you didn't forget. Mine started in 1968 when sitting in a restaurant in Seattle and a man outside was walking two Dobermans on a brace. Just a gorgeous sight. I told my husband - someday I am going to have a dog just like that! And, I did forty years later! Now we have three, so just a word of caution. Well howdy ! A year huh........well this is great. Looking forward to hearing more from you. We know there are alot of folks that strictly view.......but it says alot for our forum when those individuals actually come forward and choose to interact with us. We are the best forum in the world..............and we love to brag and boast about our pets. Welcome! Glad to have you "de-lurk!" Still working on figuring out how this particular forum operates, so my apologies if I mess up the formatting in replies. @ECIN Nope, not V-Tech or Purdue! I'm a little weird about privacy, so I probably won't mention my school by name. I love your story!! When I moved house in middle school our new neighbor also had a dobe that would just silently watch me every time I rode my bike around the neighborhood. No idea what I would have done if he ran after me! I totally understand ! and again - Welcome !